There are six ways to view a Hive project. 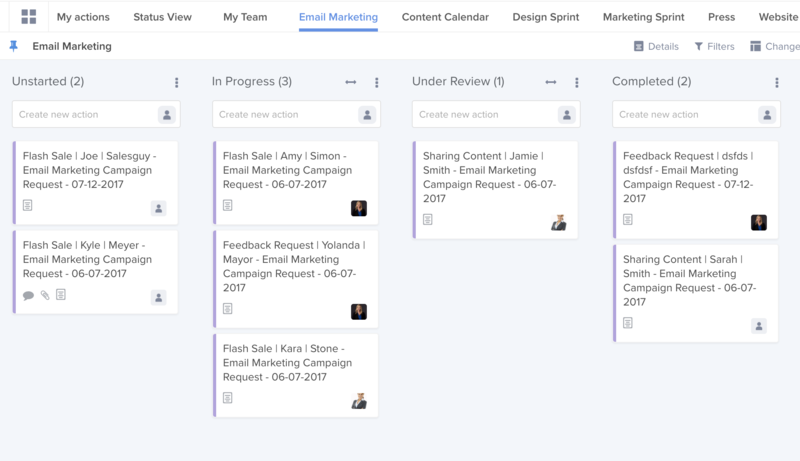 Each layout can be helpful depending on what your team is working on and how you like to organize your work. In this article, we'll provide guidance on the pros and cons of each layout. So that the next time you make a project you can choose your layout with confidence. In status view, all of your project's action cards are organized in lists that each represents a "status" in your workflow. Your actions move horizontally across the lists from unstarted to completed. You can customize the lists to fit your team's exact specifications. When is status view helpful? If you prefer a visual workflow, status view lets you see at a glance the progress of a project. If the actions in your project all go through the same statuses, it makes a lot of sense to use a status view. If your team uses Agile methods, status view is best suited to organizing and managing sprints. Those are just a few of the instances status view can be useful. In terms of downsides, status view doesn't emphasize deadlines as much as other views, and it can be a little more difficult to break it down by team member or label. As mentioned above, actions in status view move horizontally from one list to another. The default set of statuses is unstarted -> in progress -> completed. However, you can add new statuses to completely customize how your project is organized. The easiest way to add a status is to scroll over to the right of your project, add the name of your status in the text box, and press enter. 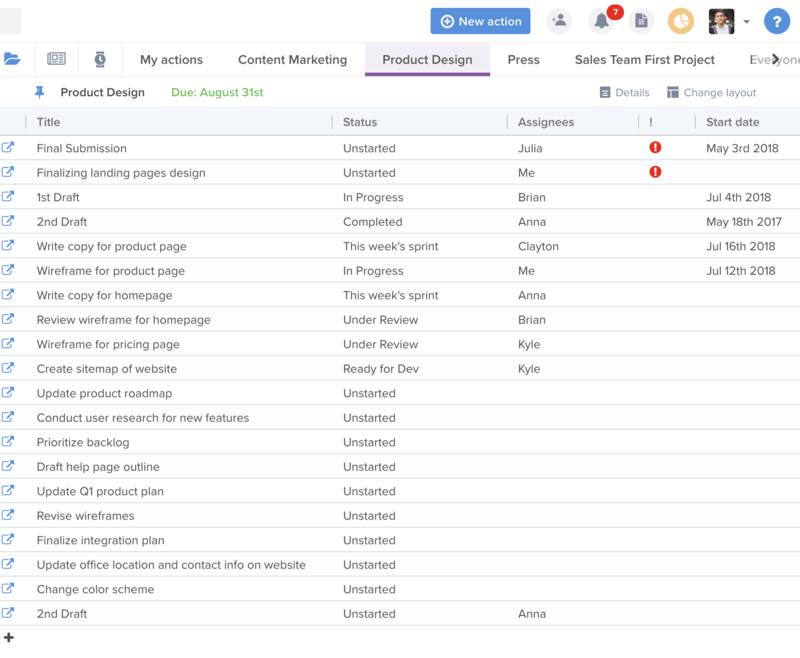 In team view, all your actions are organized under lists with each list representing a team member. You can reassign actions to other team members with a simple drag and drop, and add new actions onto someone's list with ease. When is team view helpful? It's great for managers who want an easy way to assess team workload. If actions often move from one person to another, it is super easy to move actions between team members in team view. You can keep from putting too much on people's list by adding tasks to the unassigned column. That way the first person to have some free time can pick it up by dragging it onto their list. These are just a few reasons of why having a team view can help you move your project forward. 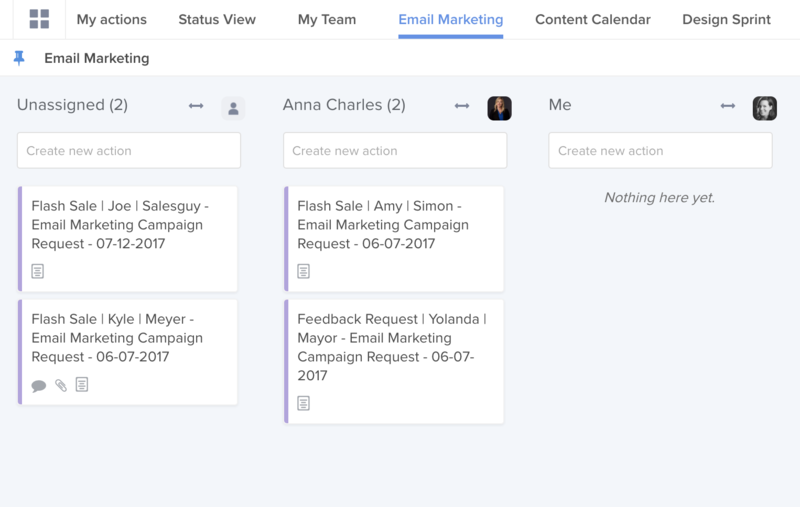 Team view is not as helpful if you need to see the status of your actions or if you are working on a project by yourself. In calendar view, you can see all that actions in your project organized by deadline. You can simply drag and drop to change an action's deadline. The default view shows all actions due for the next six weeks. Hive calendar also allows you to one-way sync with Google Calendar, Outlook, and iCal. When is calendar view helpful? 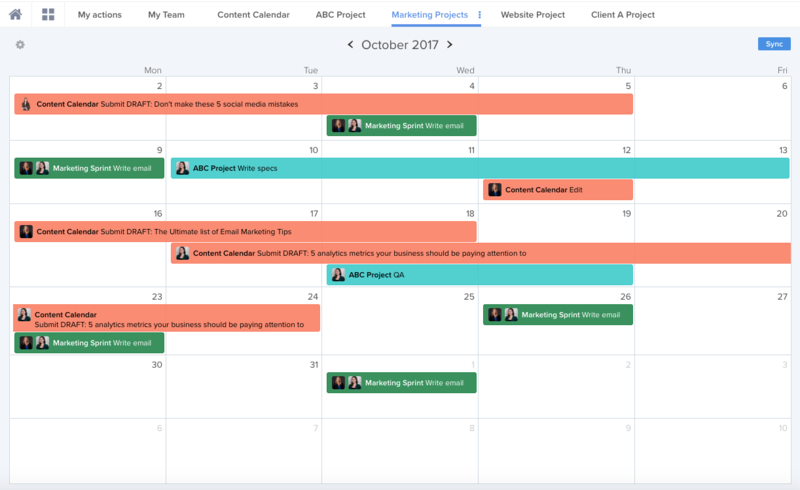 If you want your team to focus on deadlines, a calendar makes it easy to keep them top of mind. If you want to be able to view your actions on your email calendar as well, this view is the only one that allows you to do that. If you want all the actions you add to have deadlines, it's super easy to do on the calendar. You can just click the date and it automatically opens a task with that deadline. Calendar view is awesome! The only cases where it's not as useful are when you want to be able to view key details of your actions on the front of the card. In calendar view, only the title and the assignee of the action shows. It's also harder to see who on your team is working on what for the same reason. In label view, all your actions are organized under lists with each list representing a different label. You can change the label of an action with a simple drag and drop, and add new actions to a label with ease. Labels in Hive are essential tags you can add to action cards that make it easier to distinguish between different actions in a project. When is label view helpful? If your team uses several labels, this layout can be a great way to assess your workflow. If you want to easily add labels to new actions you create, all you have to do is type in an action in the text box of the label you want to add. If your team prefers a visual workflow, it helps that each action comes with a color that can make it easier spot the differences between them. Label view is not as helpful if your team doesn't really use labels or you want to be able to easily see who is responsible for an action. 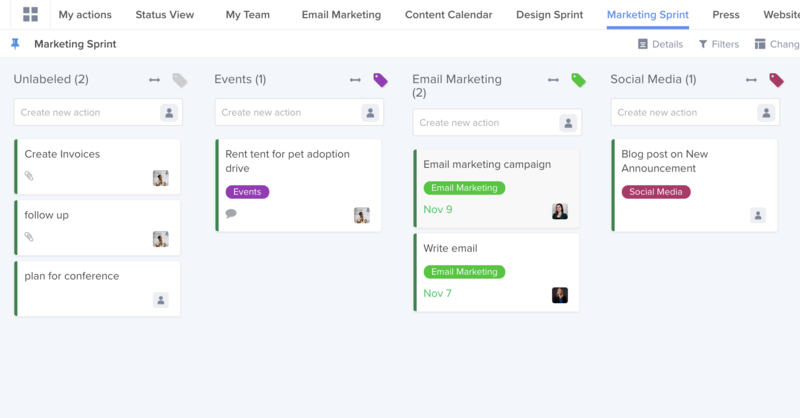 In Gantt, all your actions are laid out in a chart where each line represents something you want to do. These actions correspond to dates where the start and end point of the action represents the timeline it is expected to be completed. You can drag and drop to change the timeline and simply click to add a new action. Gantt charts includes the ability to zoom into to take a closer look and add dependencies when needed. When is Gantt Chart helpful? 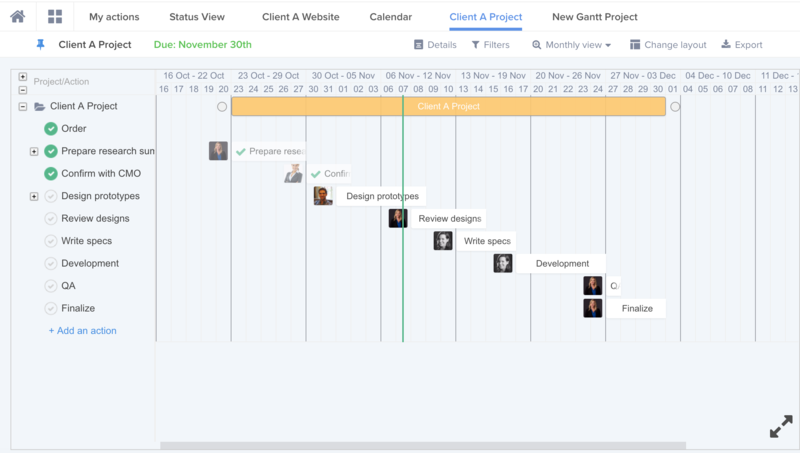 If you are trying to plan out how long a project will take, Gantt is a perfect way to assess that. If you have a clear understanding of the steps involved in completing the goal, it is really easy to lay out in a chart form. If you need to be able to share your plan with people outside your organization, Gantt allows you to export your work to PDF, PNG or XLS. Gantt view is so great for planning, but not as useful if you run in an agile framework where you never really can predict specific timelines. In Table View, all your actions are laid out in a table (like a spreadsheet). These actions can be sorted and filtered accordingly to your needs and preferences. You can easily edit the text or change the fields by clicking on it. When is Table View useful? If you are to do a multiple sort/filter. Say you want to see all actions that are unstated but overdue, you can do so quickly and flexibly in Table View. When you want to see a list of actions and make changes quickly. In table View, you can edit the field by clicking on it. Table View is so great for quick editing and filtering. However, it is important to know that first-time users may feel overwhelmed by Table View. Know that a table view is useful when you know exactly what you want.